Home / Cully-Fredricksen / James-Cromwell / Movies / Star-Trek-First-Contact-1996 / StarTrek / television / Star Trek: Five Ways to Celebrate "First Contact Day"
Star Trek: Five Ways to Celebrate "First Contact Day"
Here's how to celebrate the greatest holiday in Star Trek fandom. According to Star Trek lore, today is the day - 45 years from now - that humans first make contact with Vulcans. In "Star Trek: First Contact" inventor Zefram Cochrane has a test flight of his warp drive and that leads Vulcans to visit Earth for the first time. A holiday later formed around the day and was first shown in the "Star Trek: Voyager" episode "Homestead". 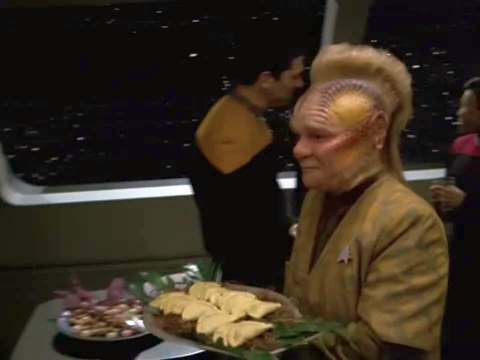 Have a Star Trek themed party for your family and friends. Have your guests come dressed as their favorite characters. Just watch Star Trek. As if you need a reason. Pick your favorite episodes or movies and start watching. You don't have to watch "First Contact" but it's a good start. You can also watch the original series. For best effect watch all the appearances of Cochran from the TV and movies in chronological order then finish with "Homestead". 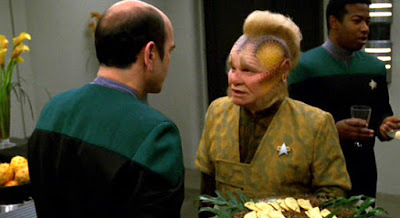 "Star Trek: Enterprise" Season 1, Episode 1/2 "Broken Bow"
"Star Trek: The Original Series" Season 2, Episode 23 "Metamorphosis"
"Star Trek: Voyager" Season 7, Episode 23 "Homestead"
Zefram Cochrane's favorite food is Cheese Pierogis. It's considered vitally important to have these on hand. "The Doctor" says they have "no nutritional value" but what does he know. "This recipe comes straight from Poland you can sub the cheese for mashed potatoes and cheese, sautéed onions and potatoes or even plums you name it, it is great I hope everyone enjoys!!!" Knead into a pliable dough let the dough rest for about 10 minutes. Cover with a WARM bowl then divide the dough into half. Place one half back under the warm bowl with the other roll out on a floured surface roll it thin use a circle cutter. Place a spoonful of the cheese mixture to one side of dough moisten edges of the circle with water before pressing firmly. Then drop them into boiling water for about five minutes or until they float to the top. Take out of the water. You can eat them like that or pan fry in butter but they taste the best fried with a side of sour cream or applesauce. ENJOY and they freeze well too. Cochrane was a huge fan of late-20th-century rock and roll music. His favorite songs included "Ooby Dooby" by Roy Orbison and "Magic Carpet Ride" by Steppenwolf. He would play "Magic carpet Ride" before every launch and freaked out if he didn't have it. The first greeting to humanity was in the traditional Vulcan salute with the words "Live long and prosper". You can greet everyone by using this traditional greeting. Raise your hands with your palm facing outwards, and your thumb away from your hand. Part your middle and ring finger such that the index and middle finger are together and your ring and little finger are close to each other. Note: Some find the separation between the fingers the hardest part so you may have to hold the fingers together to stretch them out. Are you celebrating "First Contact Day"?